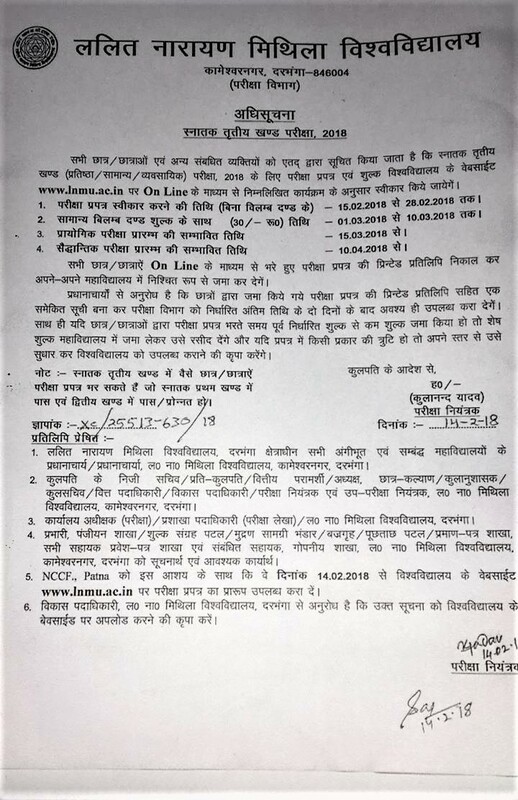 LNMU Part 3 Examination Date 2018 - Are you a student of Lalit Narayan Mithila University UG Session 2015-18? Here's an extremely Important Update for you related to the upcoming Degree 3rd Year Examination 2018! Looking for year 2019 instead, head over to this post! 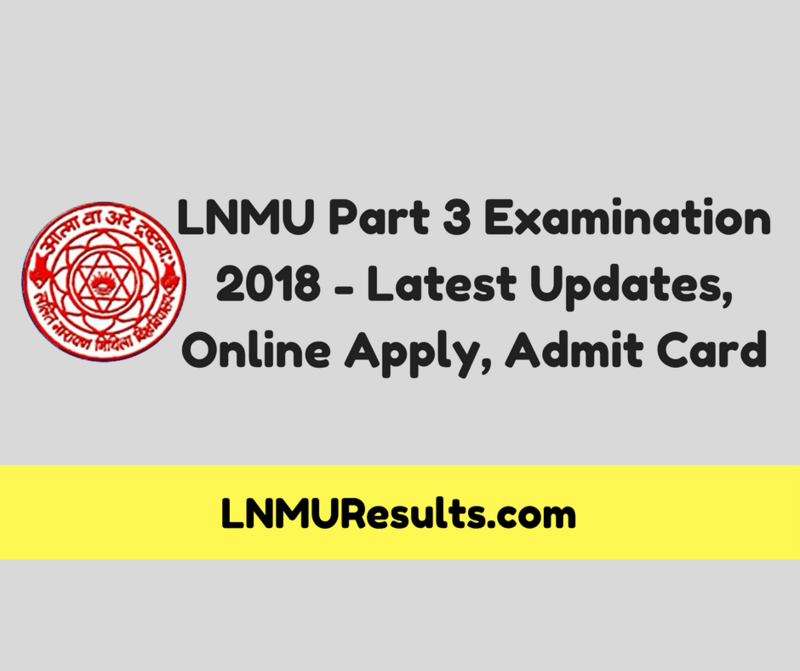 In this post, you will be getting all the latest and current updates regarding the LNMU Part 3 B.A, B.Com, B.Sc Examination like Form Apply Date, Admit Cards and other. Recently, In a notification released by the University, it is announced that the Upcoming Degree Part 3 Written Examinations of B.A, B.Com & B.Sc will be conducted in the month of April 2018. Examination form will be filled in the month of February and Practicals will be taken before the Written Examinations. Degree Second Year Examinations of LNMU Darbhanga were conducted in the month of October-November 2017 followed by Viva and Practicals and results can be expected in the Last week of January. Looks like University is in a hurry and want to complete the Session 2015-18 til June 2018 by declaring the final year results. According to the notification, as a new rule, Practical exams will be conducted before the Written ones. Submission of Examination Form will be starting from 15th February 2018 and till 10th March 2018. Here's the overall examination schedule of LNMU Darbhanga 3rd Part Examination 2018! Stay updates with this post for further announcements. But, As the LNMU Part 2 Results are yet to be declared, candidates will have to wait. After declaration of the results, Online Apply for LNMU Part 3 Examination will be started from 15th February 2018 and online application forms will be filled and after that, Admit cards will be released. In this section, details related to online applications and time period of all the activities like Examination form filling, Admit Cards issuing and others will be shared. So, according to the schedule, Online Apply will be submitted from 15/02/2018 to 10/03/2018. Most probably, Applications will be filled online as the University has shifted all of their form filling activites to online mode. Application Fee and form filling process is yet be revealed so there's no update regarding that. I will be updating all the details in the below table as soon as there will be something new. Update (04 Feb, 2018) - As you know that the Second year results have been published. Now next is the notification related to Online Apply for Degree Third year. Meanwhile,e there will be some Important activities like Marksheet distribution and the Admission in the Final Year. Update (15 Feb, 2018) - Okay, So It's 15 February and Online Applications are supposed to be live from today onwards. University has released and notification related to the Part 3 Online Application but website is not live now. Update (16 Feb, 2018) - University has finally starting accepting online application forms for the conducting Degree Part 3 Examination 2018. Candidates can now fill their online applications. For more information, check the table. Update (08 Mar, 2018) - Alright, so here are the latest updates you need to know about the upcoming Degree Part 3 Examination 2018 of LNMU Darbhanga. In the first released notification, the Online application ending ate (without fine) was 28th February but now it is extended to 10 March 2018 and with fine (Rs. 30 Extra) - 18 March 2018. So as you know the probable date of starting of Practical exams were 15th March, which is now extended to 20th March. That's all the latest update regarding this examination. No updates on the Admit Card availability dates yet! Update (27 Mar, 2018) - Alright. So looks like the wait is over and University has released the Degree Part 3 Exam Schedule starting from 10th April 2018. Download it from the above table and stay tuned for more updates. Stay connected with us and We will keep you updated with every single update. Admit cards will be available to download as soon as the online applications will be closed. As this whole process is yet to happen, there's no update regarding the Download of LNMU 3rd Year Admit Cards. Once it will be released, this section will be updated with the link to download the same. Stay Updated. Update (02 April, 2018) - Yeah. University has released the Admit card for conducting degree part 3 examination. You can download it by clicking on the below button. So, that's all on this topic and I am sure you got all the details regarding the Part 3 Examination. Still, if you have any further queries or have any question, feel free to drop them in comments and I would like to answer them as soon as possible. Till now, you can share this post with your mates who are also a candidate and going to appear in the LNMU Part 3 Examination 2018.